From the minute your little one is born, it’s absolutely normal to be overwhelmed with worry. The first few weeks can be tough as you’re constantly looking out for anything that might be wrong. As your baby’s immune system is still developing, they are at an increased risk of picking up various illnesses. Most of the time, when newborns get sick, it’s nothing to worry about. However, as they are so fragile, it’s still worth taking them to the doctor if you are concerned. Here, we’ll look at some of the most alarming newborn illnesses to watch out for that are actually quite normal. The birthing process isn’t just difficult for you, it’s also pretty rough on baby too! It’s not uncommon for babies to suffer alarming injuries during birth, but it’s important to note that they do usually heal pretty quickly on their own. However, it is worth having baby checked out to ensure they are healing properly. Some of the most common birthing injuries include forceps marks, broken collarbone and muscle weakness. Even the name of this condition alone can spark fear into new parents. However, it’s one of the most common illnesses newborns tend to suffer with. It basically means they have a protruding tummy. Now, the only time you should worry about abdominal distension is if the tummy feels swollen and hard. Even then, it’s likely to be trapped gas or potentially constipation (common in bottle fed babies). However, a hard, swollen tummy should always be checked over by a doctor or pediatrician as in rare cases it could be a sign of a more severe underlying problem. Mild fevers are common in newborns and they are a sign that your little one is battling a slight infection. The mild fever shows the immune system is working and will usually not require any form of medical assistance. If the fever is high on the other hand, it should be checked out by a doctor, particularly if it is running at 102 F.
The only thing many people know about jaundice is that it is an indicator of liver disease. Therefore, it’s understandable you might panic if you notice your newborn is a slightly yellow color. However, it’s very common for babies to present with jaundice after birth as they have higher levels of Bilirubin due to having an immature liver. This typically corrects itself over time, but it can potentially be an indicator of a more serious issue. So, rather than leaving it, have a doctor prescribe a suitable treatment to ensure it doesn’t lead to a more serious condition. It’s also worth noting that although in the past it has been theorized that jaundice in babies can lead to brain damage, that theory has since been disproved. After birth, it’s very common for babies to have bluish colored feet and hands. Again, this is nothing usually to be concerned about, but if it doesn’t appear to be correcting itself, you will need to consult a doctor immediately. Though less common, babies can also develop a bluish color around the mouth or tongue due to crying. Oral thrush occurs due to feeding when there’s high levels of yeast present in baby’s mouth. They may require an antifungal medication so you should talk to your pediatrician if you suspect your little one is suffering from the condition. The symptom to watch out for is white patches within the mouth. Cradle cap looks quite unpleasant, but it isn’t actually harmful to your little one. It appears as greasy, red scales along with excessive flaking of the scalp and is caused by a buildup of dead skin cells and oil. This is one of the few illnesses you can usually treat yourself. Simply wash baby’s head with a mild, gentle shampoo a little more frequently than usual. You can also try softly brushing baby’s head to remove the dead skin cells. If you don’t notice any change in the condition, consult a doctor as they may be able to prescribe you with a stronger ointment or shampoo. After birth, one or both of baby’s tear ducts may be fully or partially blocked. This causes a sticky mucus or a water build-up in the corner of the eye. Most baby’s tear ducts open up properly after around two weeks, though it is possible to encourage them to open by gently massaging the inner corner of your little one’s eye. By far one of the most distressing illnesses some newborns suffer is colic. This leads to constant, often unbearable, crying fits. Obviously, babies cry, but there is usually a reason behind it. If baby isn’t hungry, doesn’t need changing, isn’t overly tired and they’ve had plenty of love and attention, colic could be the problem. There will be no other signs of illness if colic is the issue and the condition typically resolves itself within three months. Seeing tiny red spots breaking out on baby’s face can be alarming. However, it’s very common, particularly during the four or five-week stage. There’s a theory that baby acne occurs due to pregnancy hormones which can stimulate the oil glands within your little one’s skin. To treat the condition, avoid using a harsh detergent when washing baby’s clothing and use a mild baby soap once each day on baby’s face. Overall, there are many illnesses your newborn can pick up and the majority, although alarming, are not actually dangerous. However, when it comes to the health of your baby, you can never be too careful. Therefore, it is always worth consulting your pediatrician or doctor for advice and a proper diagnosis. When your baby got vaccine shots, he developed a fever. It was 101-degree Ferenhite. We were frightened. We consulted the doctor and he said fever is common after the vaccine. WE gave him medicine and the next day he was fine. Our child has been affected with some of these conditions and we were alarmed at first, but later knew that the baby will be fine. Any new parent could worry about things that seem unusual in a baby. This is just normal because these things could sometimes really look out of the ordinary. I would rather worry and get it checked just to be sure. It’s always better to be safe than sorry. If it turns out to be something normal, be thankful. New parents pass through a great deal of worries with their new born babies, especially those that are still new at the job of being a parent to a new born baby. The following illness outlined and explained above could easily give a huge scare to the parents because they certainly wouldn’t know their left from their right in knowing how best to tackle the problem. It’s true that a baby’s immune system is still developing at their young age which is why they are exposed to so many illness at their tender age. This is actually why babies are vaccinated a lot in order to make up for their low immune system. This article is very important, as well as informative, educative and interesting, especially for new parents that are yet to have their first baby or those that just had theirs. It’s going to be of a great help in letting them know what they are heading into and what to expect. It is indeed important for new parents to know about these baby things so they’ll know what to do when they encounter any of these. 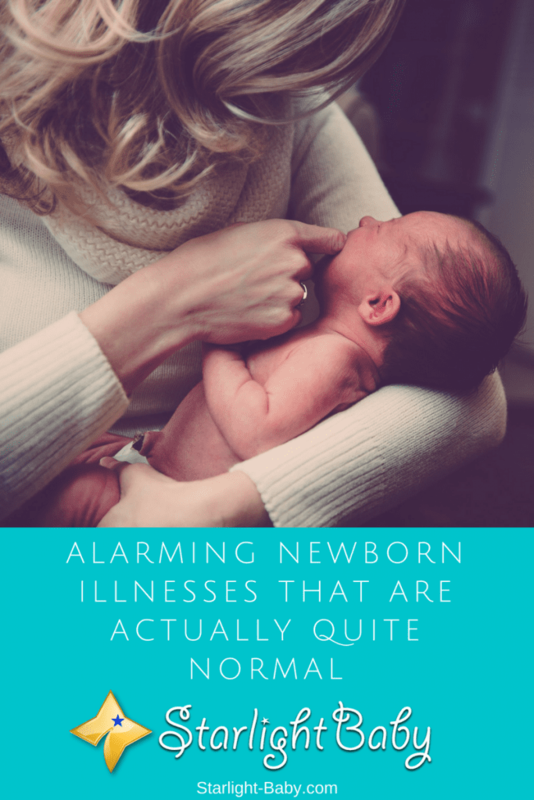 As you’ve said, it’s a “great help in letting them know what they are heading into.” With so much baby blogs/articles like this on the internet, parents should take it upon themselves to learn more about baby illnesses. My baby had acne when he was still a week old and some people actually advised to apply some lotion on it but for the fear of causing more harm to my child by applying something which I’m not sure how it would react to the over sensitive skin of a new born, I didn’t. It took some weeks more and the red acne cleared on its own. Taking advice from just about anyone with regards to one’s baby’s health shouldn’t be encouraged.